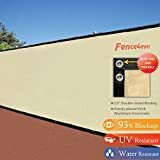 Made with weather resistant vinyl with a 10 year warranty. Won't crack, warp, yellow, splinter, or rot. No painting, staining or maintaining required! 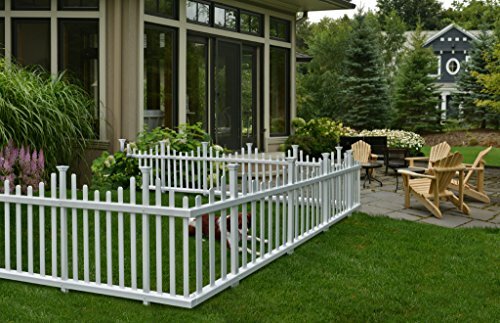 Create instant landscaping in your yard or garden with this easy to install no-dig garden picket fence. Made with premium vinyl materials, this fence will not rust, rot or deteriorate from the elements. To install, you simply insert the stakes deep into the ground (included). This means you don't need to tear up your yard to install it and you also don't need to clean up any dirt after installation! 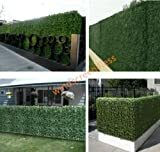 Each kit contains 2 sections for a total of 116in of fence and is perfect to define boundaries in your yard or garden or contain small children and pets. Made from extruded PVC, the pickets go through the rails which allows for easier assembly. This also means that your pickets won't fall off over time and that the fence looks the same from both sides.